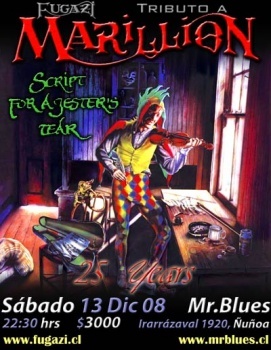 Celebrating the 25th anniversary of the Marillion debut album Script for a Jester’s Tear is an issue for Marillion fans all over the world. Dutch fans will see Mick Pointer and well known friends of the prog scene performing the album live in January 2009. Last Saturday night, Chilean fans enjoyed a great gig in Santiago with the local tribute band Fugazi, performing the whole classic album plus other Marillion tracks live. 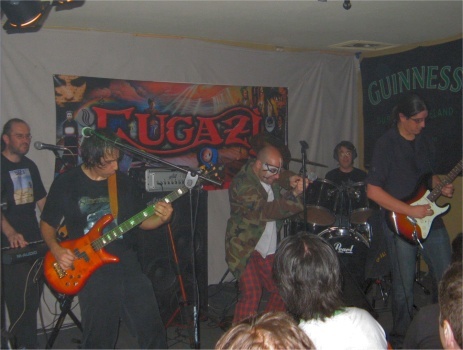 Members of Fugazi are Max Sanchez on vocals, Claudio Momberg on keyboards, Jose Luis Ramos on bass, Leonardo Basso on guitar and his brother Franco Basso on drums. Max, Claudio and Leo are members of the prog band Subterra that released the DPRP recommended album Sombras de Invierno and afterwards Cautiverio. Subterra was the support band of Fish when he toured in Santiago with Return to Childhood in 2005. 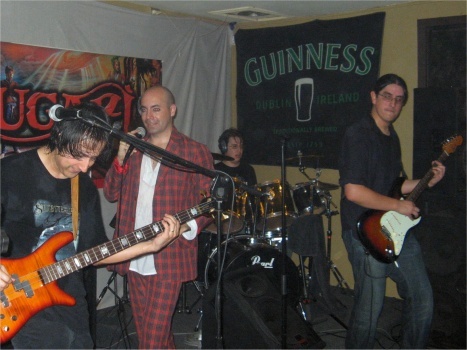 Max, Claudio and Jose Luis played with Clive Nolan and Agnieszka Swita when they played in Santiago in May 2007 and they also appear in a couple of tracks on the Caamora live album Journey’s End…. Claudio has a solo project called SETI that has released the excellent album Signals. All the above mentioned albums have been released by Mylodon Records and distributed by Musea in Europe. The small pub was packed with Marillion fans and friends of Fugazi when the band took the stage at 23:20. They performed the Script for a Jester’s Tear album entirely, with outstanding perfection and fidelity. The musicians played powerfully and enthusiastically the homonymous song followed by He Knows You Know and The Web, where Franco’s drumming was highly acclaimed. In Garden Party Claudio showed the good keyboard player he is with a superb performance. Leo’s guitar playing was excellent all over the gig, particularly in Chelsea Monday. As a front man Max painted his face and changed jackets following Fish’s style, like the military jacket in Forgotten Sons. All the tracks were supported by the excellent bass guitar of Jose Luis, who is a fantastic musician and sound engineer too. After a short intermission the band returned to the stage to play other Marillion songs, beginning with Hotel Hobbies, Warm Wet Circles and That Time of the Night from the Clutching at Straws album. Then Fugazi turned into the Hogarth’s era playing Easter and No One Can. Max’s voice is very powerful and versatile in such a way he can perfectly manage both styles. Returning to the past, a great version of Punch and Judy was played and then they went into the Marbles era to play Fantastic Place. The long awaited Pseudo Silk Kimono/ Kayleigh and Lavender came afterwards, with Max wearing the traditional Misplaced Childhood red jacket, and everybody in the pub sang both songs. At that time of the night the ambient inside the pub was smoky and warm but nobody went home until the end. Finally, Fugazi played The Last Straw and Cover my Eyes, and concluded the gig playing the powerful track Incommunicado with everybody in the audience clapping and singing. Two hours of great Marillion music, including the best of both worlds, played by fantastic musicians to commemorate 25 years since the original album saw the light in 1983. It was a great night indeed. DPRP's Review of Subterra's "Sombras De Invierno"